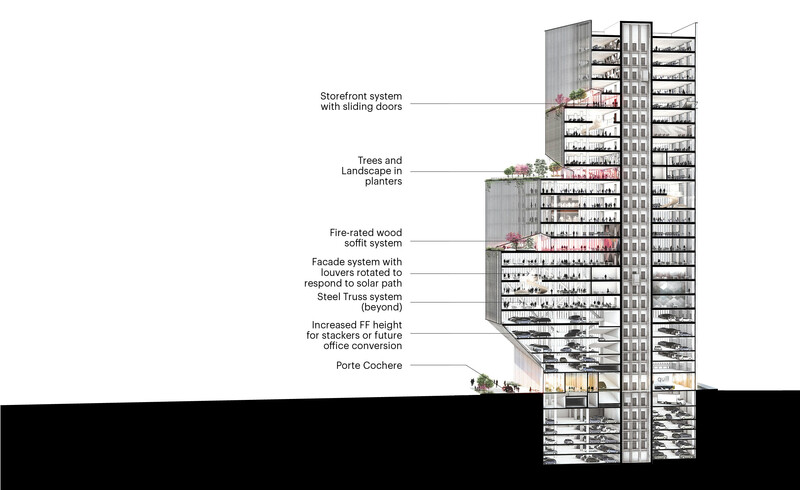 Front Street Tower is conceived as a vertical community formed by the constraints of the site to define a new professional workplace community dispersed throughout the 21-story office tower. 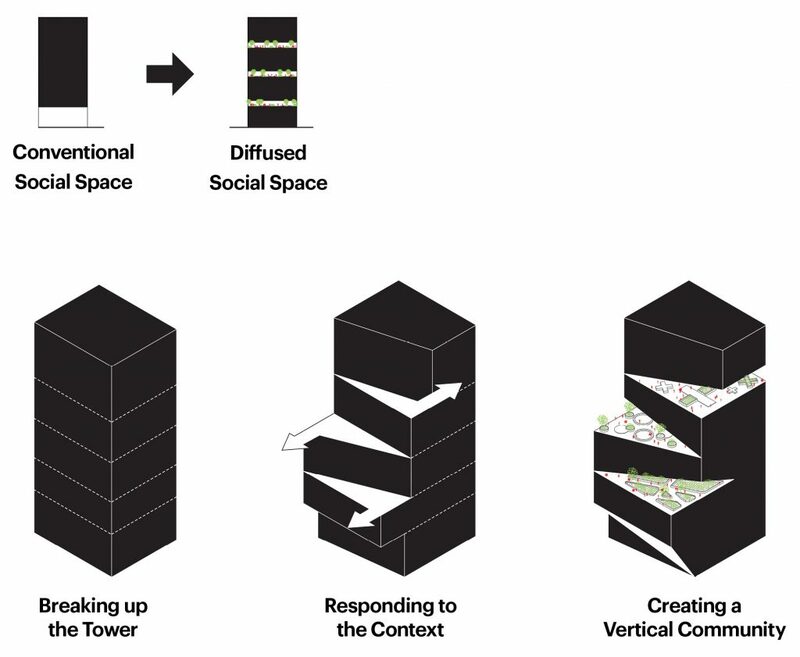 While a conventional office tower concentrates social spaces at ground level lobbies that are mostly vacant, this new professional workplace typology distributes social space throughout the building. 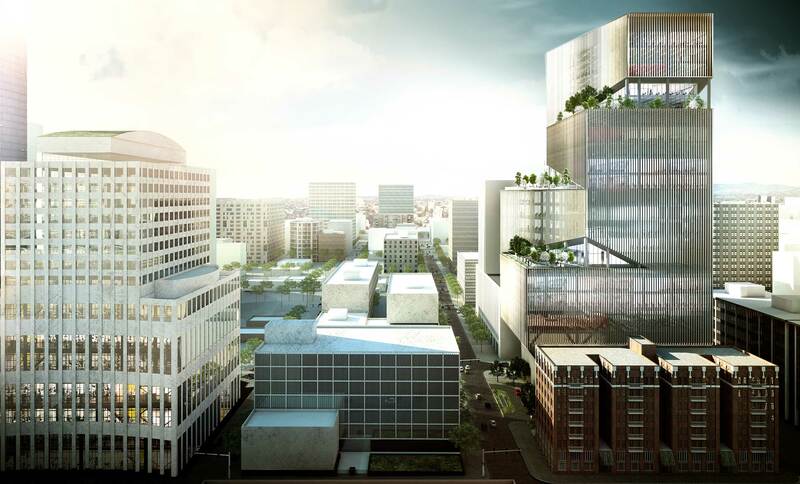 The reallocation integrates nature into the workplace via large outdoor terraces that feature meaningful amenities and promote overall wellness. Front Street Tower is situated in the Civic Core of Downtown San Diego, bounded by the Gaslamp Quarter and Columbia district. This location provides easy access to a unique blend of hospitality, restaurant, shopping, office, and nightlife that supports a 24-hour activity on the site. 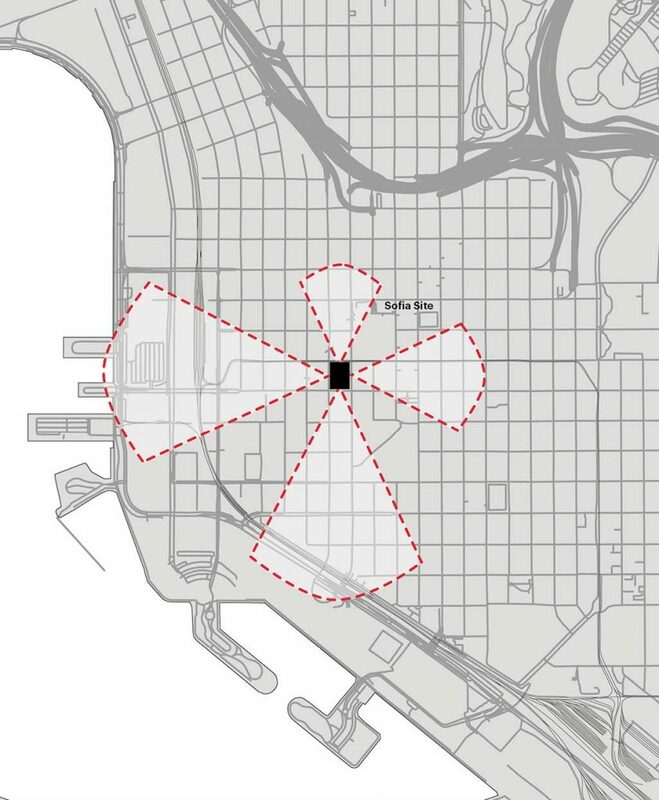 Defined by a two-sideness, the site takes advantage of the Civic uses to the North, and of the commercial uses to the South. 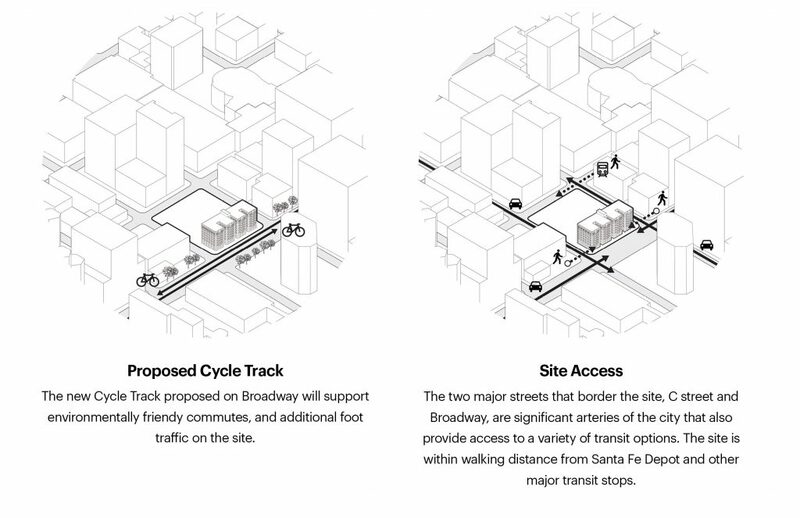 As mobility starts to evolve in San Diego, this project has a variety of transit mediums available at it’s fingertips. Within walking distance are bus lines, light rail lines, cycle tracks, and interstate train stops that promote sustainable commuting. The San Diego fault line transecting the block defines the maximum perimeter. Four floors of above grade parking at the podium (designed to become convertible to office later) obey this boundary, but immediately above a cantilevered mass reclaims buildable area. 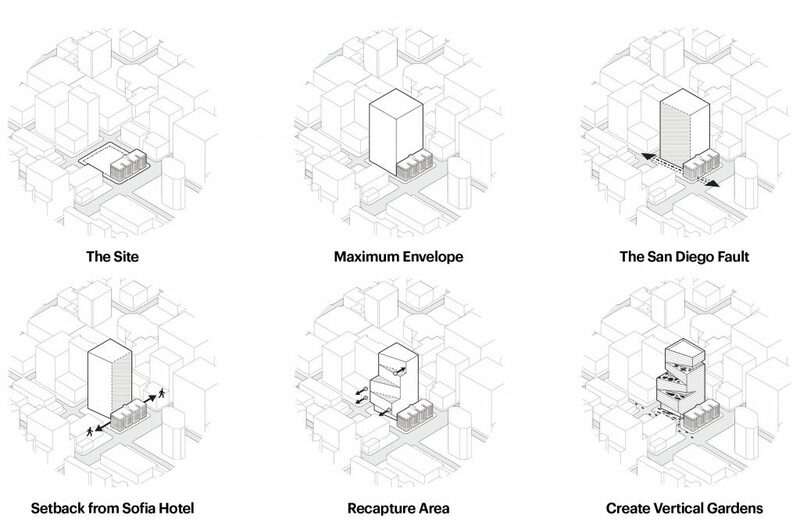 Each subsequent offset mass steps backward based on structural and zoning requirements to create generous elevated gardens replete with gardens, fitness space, and other wellness amenities. 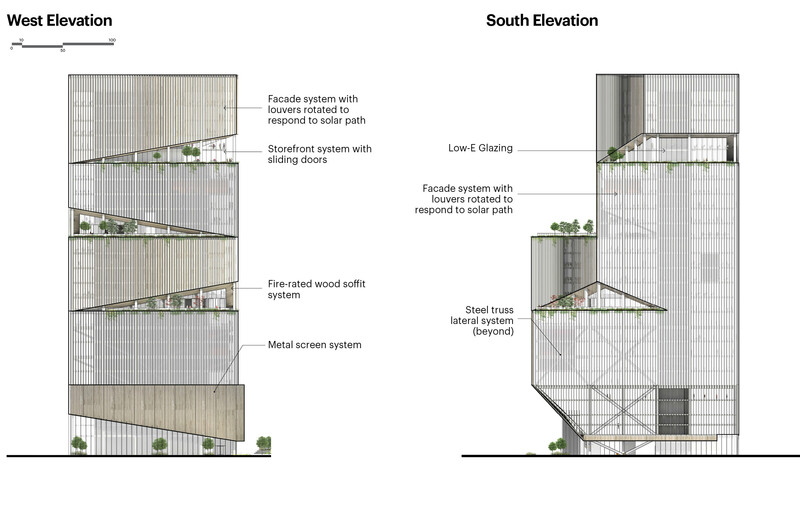 The façade is tuned to its solar orientation, articulated with twisted louvers that splay in response to the solar orientation along the facades. 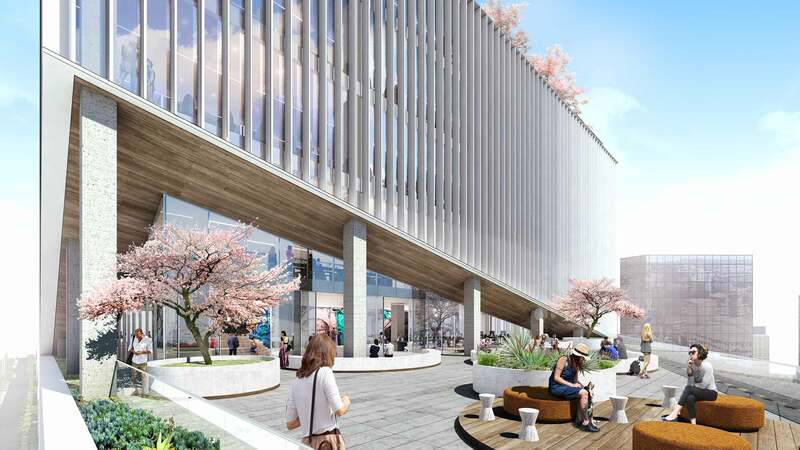 With its prime views of the marina, urban ground level, and new workplace experience, Front Street Tower is poised to provide premium experiences within San Diego while redefining the workplace typology for the modern workforce. 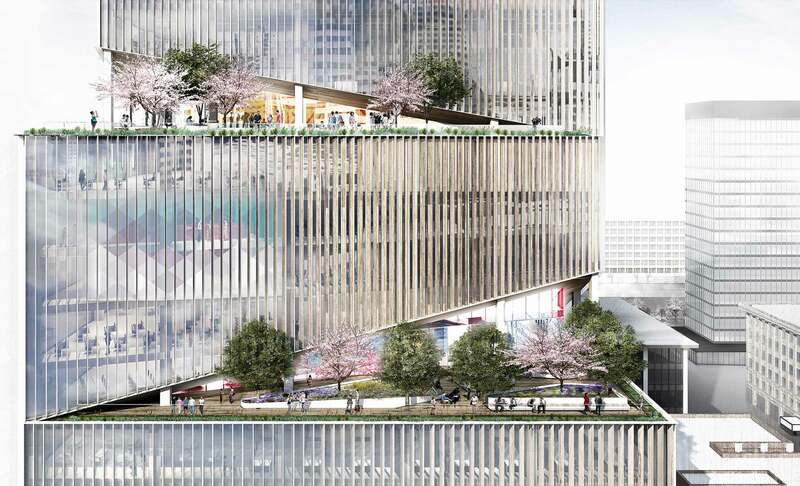 The conventional office tower concentrates the building’s social spaces to the ground level, creating large lobbies that are mostly used for circulation and left vacant. The new professional workplace seeks to rethink this typology by diffusing the social space throughout the building. This reallocation brings nature to the workplace, providing meaningful amenities and promoting overall wellness. 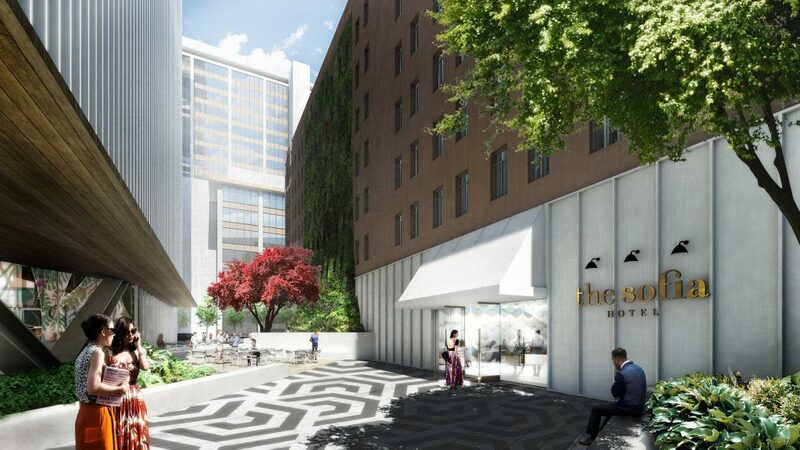 The tower is set back 40 feet from the hotel, establishing a mid-block connection common to downtown San Diego that becomes an important pedestrian parklet amenity with a refined entry experience for the office tower and hotel.